The new legislation will provide for compensation for homeowners in Mayo and Galway. THE PROJECT IS now long-delayed and much-maligned but homeowners could be set for compensation from the rural broadband project. New legislation has been brought to cabinet by Minister for Communications Denis Naughten that will allow the government access to private lands along routes in Galway and Mayo to lay down new broadband fibre cables. It will essentially mean a compulsory purchase order (CPO) can be used for sections of land without the owner’s consent. The government has used CPOs in the past to build other infrastructural projects such as motorways and the Luas works. A major question mark was put over the entire rural broadband plan this week, however, after it emerged that Eir had withdrawn from the bidding process. It came as a major blow to plans to bring high-speed broadband to 540,000 homes and business in rural areas around the country. As previously explained by Fora, the National Broadband Plan has hit a number of stumbling blocks since it was first announced in 2012. It took until 2014 for the ‘stakeholder consultation’ phase of the project get under way. 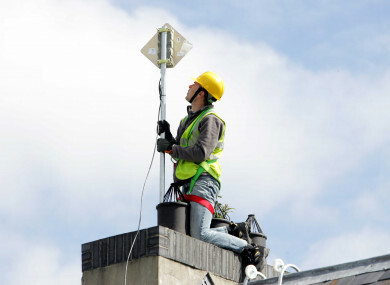 It’s been estimated that 840,000 premises have been targeted as being in need of high-speed connections. Eir has committed to rolling out broadband to 300,000 of those, leaving 540,000 that need State help under the National Broadband Plan. It is that latter tender process that Eir has now pulled out of. The Telecommunications Services (Ducting and Cables) Bill, meanwhile, will attempt to ease along the process of laying down these fibre cables in parts of Connacht to smooth the project’s passage in these areas. It will give the government, or the appointed installer of the broadband, to lay, construct, use, inspect, maintain, repair, replace, remove or render unusable any ducting and cables. Without a law giving the contractor the rights to do this on private land, the project to bring high-speed broadband to the region would not be possible, the government said. The new legislation will ensure “that disruption is minimised and provides for compensation to be paid by the minister to landowners arising from the transfer or acquisition of the rights, as the case may be”, the government said. It also provides for the transfer of existing “legal interests” from Gas Networks Ireland, so that compensation payments paid to landowners already from CPOs from Gas Networks Ireland will be taken into account when calculating additional compensation. The bill also provides for damages when access is required to maintain the “operational integrity of the infrastructure”. Read: Why did Eir quit – and what happens now for rural broadband? Email “Rural broadband: Compensation for homeowners as new law to give access to private land”. Feedback on “Rural broadband: Compensation for homeowners as new law to give access to private land”.